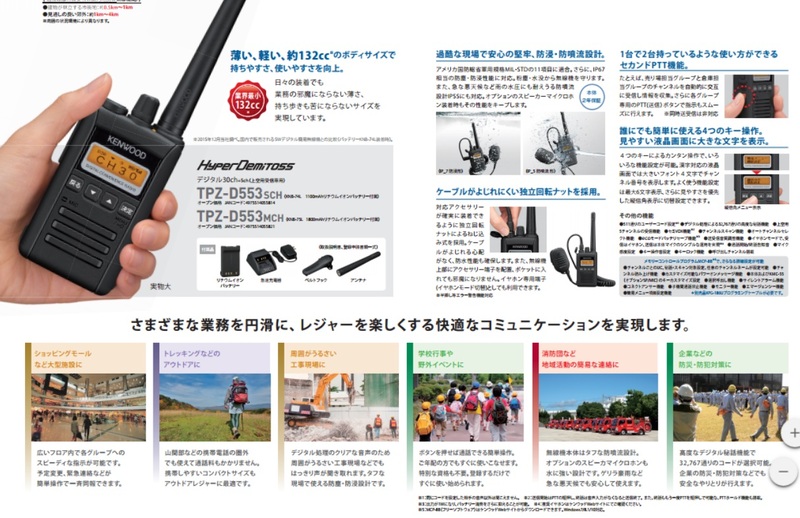 ● TPZ-D553 is a digital simple radio registration authority of the ultra-compact lightweight type of about 132cc. ● TPZ-D553SCH is comes with a flat-screen battery KNB-74L (7.4V / 1100mAh), TPZ-D553MCH since the large capacity type of battery KNB-75L (7.4V / 1800mAh) are included, your applications Can you select by. ● Fits to 11 items of the United States Department of Defense Military Standard MIL-STD. ● dust-proof and waterproof level “IP54 / 55/67” performance. 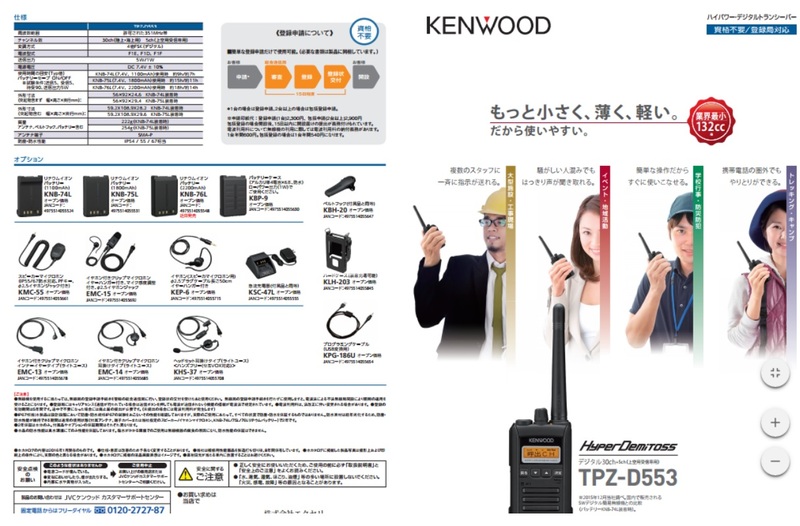 ● audio accessory attachment portion adopts screw-in by independent rotation nut. 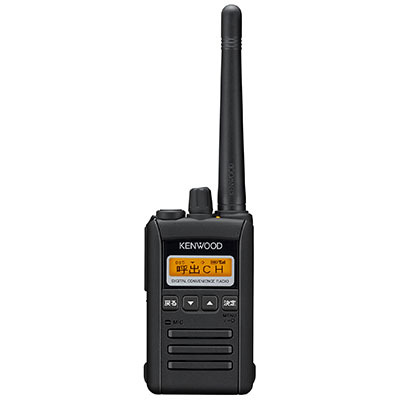 It is free from cable kinking, when it is equipped with a speaker microphone KMC-55 you can use while securing the waterproof performance of the body. ● LCD screen Kanji support. 4 can display the channel number with a letter, frequently used function is set, you can display up to six characters. You can also switch to the double-height display that gave priority to visibility. ● two channels automatically received alternately, the second PTT featured of collecting information. ● of 511 ways possible “user code communication”. ● with advanced privacy function of ways 32,767. ● reception featured sky for 5ch. 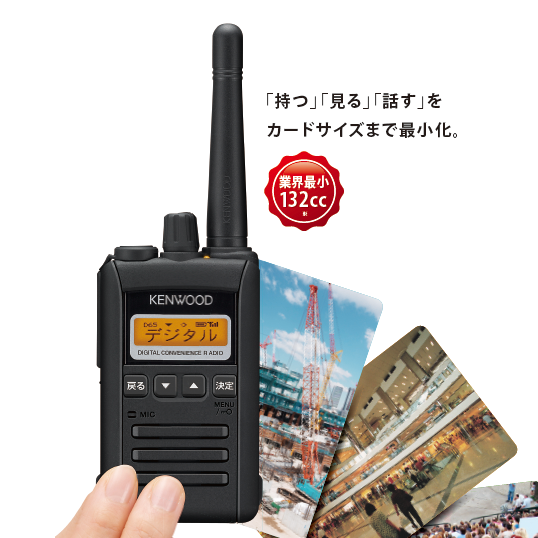 ● equipped with a semi-VOX function, call start the PTT (transmit) button once to press if the start of transmission, call termination is the end of transmission and voice input is lost to MIC. It also is equipped with PTT hold function can be terminated by pressing the PTT again also attached story. ● unspecified number also can call the channel equipped with a call. ● locate the channels of the group, also the channel scan function equipped to be able to check the usage status of the channel. ● to find a free channel automatically, auto channel select function equipped to attract even the other party to the same channel. You can mitigate the interference at the place group is large. ● to focus on energy saving in the output 1W, and equipped with eco mode battery saving function. ● his voice, sending and receiving sound quality adjustment featured digital sound that corresponds to the reception quality of taste. Also, you can choose the appropriate quality setting according to the optional external microphone. ● earphone mode available. Reception earphone, sending you can use the microphone of the body. ● call start notification sound and call termination notification sound settings, microphone sensitivity settings, key operation sound settings, key lock is also available. ● below, it is possible to detail the following settings in which to use the programming cable KGP-186U of memory control program MCP-8B and sold separately. UC for each channel, privacy, scan target setting, can be set any of the channel name. Optionally equipped with customizable power-on message functions and. Key customizable set of-body and KMS-55 (option SP / MIC). – The handset between calls prohibited featured. And simple menu item setting function.